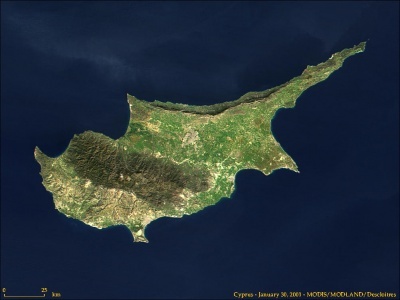 NASA Satellite Image of the Island of Cyprus. Cyprus is the third largest island in the Mediterranean, known as "Aphrodite's island", as Greek Mythology has it that the love goddess was born there. Its name is derived from the word for copper which was mined there since antiquity. Its population of nearly 900,000 inhabitants consists of over 700,000 Greeks, 160,000 Turks, 8,000 Armenians and Maronites. The rest are foreign workers or retirees. The island's main cities are Lefkosia (Nicosia), Lemesos (Limassol), Larnaca, Paphos and Ammochostos (Famagusta) and Kyrenia in the north. The central plain is called Mesaoria. There are two mountain ranges: The Pentadaktylos to the north and the Troodos to the south and west. There are also scattered but significant plains along the southern coast. The climate is temperate, Mediterranean with hot, dry summers and cool, variably rainy winters. The island was settled by Mycenean Greeks in 1500BC. They were joined 3 centuries later by Achaean colonists. It has been conquered many times passing from Assyrians to Egyptians to Persians until it was liberated by Athenian general Kimon. The Romans conquered Cyprus in the 1st Century BC. It was during this period that Christianity came to Cyprus through the Apostle Paul and Barnabas. The island became part of the Byzantine Empire after the Roman Empire's split into East and West. After 1190, new conquerors came: The Crusaders, the Lusignan, the Venetians, the Ottomans and the British (1878). It was during British rule that the island's Greek population's hopes arose for Enosis (Union) with mother Greece. Frustration with the British rulers' insensitivity towards the majority population's wishes led to protests in 1931, a plebiscite conducted by the Church in 1950 (96% voted for Enosis) and, eventually, the armed struggle of EOKA (Εθνική Οργάνωσις Κυπρίων Αγωνιστών) - National Organisation of Cypriot Fighters - (1955 - 1959). The struggle was led by Colonel (later General) Georgios Grivas under the nom-de-guerre "Digenis". The political leader was the Archbishop of Cyprus Makarios III. As many Greeks quit the public sector in support of the struggle, the British started recruiting Turks to replace them and soon the two communities found themselves at odds. This was made worse by broadcasts from the Turkish mainland urging the Turks of Cyprus to demand equality and by the pogrom against the Greek community in Istanbul (September 1955). Eventually, the British government decided to compromise and, through the treaties of London and Zurich, the Republic of Cyprus was born (1960). EOKA fighters came down from the mountains to a hero's welcome and Archbishop Makarios III was elected Cyprus' first President. Turkish Cypriot leader, Dr. Fazil Kucuk, served as his Vice-President. Unfortunately, the island's troubles did not cease with independence. Many Greeks resented the compromises of the treaties of London and Zurich that granted quotas to the Turkish minority in the Police Service, the Civil Service and a veto over any legislation. In November 1963, Makarios declared the constitution as unworkable and suggested 13 amendments. The Turkish minority reacted and soon intercommunal war broke out. Turkey bombarded the island in support of the Turkish Cypriots and threatened to invade. Greek Prime Minister Georgios Papandreou sent one division to Cyprus and war between Greece and Turkey became a very real possibility. Through the efforts of the United Nations and the United States, war was averted. The Turkish Cypriot minority, from this point forward, withdrew into enclaves and withdrew from the Cypriot legislature, content to running its own affairs. In 1967, communal strife again broke. The cause was a road block thrown up by Turkish Cypriots which Greek Cypriot National Guardsmen, led by General Georgios Grivas removed. The Guardsmen were fired upon and in the exchange of fire that ensued, several Turks were killed. Turkey once again threatened to invade but were thwarted again by UN and US efforts. However, in exchange for Turkey abandoning plans of invasion, the junta running Greece had to call back the division originally sent by Georgios Papandreou, an act which displeased many nationalists on the island. General Grivas was also recalled. The relationship between the junta and Makarios was very uneasy as each side found it hard to conceal their dislike for the other. Right-wing Greek officers, loyal to the junta were appointed to head the Cypriot National Guard and Grivas was sent back, in secret, to organise the EOKA B' guerrila force to overthrow Makarios. The Archbishop reacted by purchasing weapons from Czechoslovakia. Early in 1974, Grivas passed away. Makarios offered amnesty to those in EOKA B' who would disarm but few did. Makarios then, in the Summer of that year, proceeded to demand that the junta withdraw all officers from the National Guard that displeased him. The junta reacted by staging a coup d' etat against President Makarios on July 15 1974. The Archbishop fled the island and newspaper editor Nikos Georgiadis, who had fought the British under the name "Sampson", was proclaimed President in his place. Makarios, from abroad called for armed resistance from his supporters while Turkish Premier, Bulent Ecevit, threatened war against Greece whom he blamed for this "fait accompli". US mediation this time was half-hearted and on July 20, 1974, Turkey invaded Cyprus. Greece reacted by mobilising for war but the Greek Armed forces turned back and deposed the junta ending their 7-year reign. In Cyprus a truce, brokered in Geneva, was declared, "President" Sampson resigned and Glafkos Clerides - chairman of the Democratic Rally "ΔΗ.ΣΥ" Party took over temporarily until Makarios could return. The Geneva truce did not hold up as Turkey used it to build up their forces in Cyprus to nearly 40,000 and, although the pre-war order had been restored, on August 14 they launched the second phase of the invasion occupying 40% of the north of the island. In the process, 200,000 Cypriots were displaced becoming refugees in the south. Negotiations have taken place ever since but without any result. United Nations resolutions have been passed, calling for withdrawal of Turkey's troops, but again without result. In the meantime, the Turkish-occupied north, under Suleyman Demirel, proclaimed itself independent in 1983 under the name "Turkish Republic of Northern Cyprus" ("Kuzey Kibris Turk Cumhuriyet"). Only Turkey has recognised this "state". Makarios passed away in 1977. The current President of Cyprus is Dimitris Christofias of the AKEL. Each province is headed by an "Eparch" (Greek Έπαρχος) who is appointed by the central government and is considered a civil servant rather than an elected official. Cyprus has a well-developed system of primary and secondary education offering both public and private education with the option of attending either Catholic or traditional Orthodox Private Schools. The majority of Cypriots receive their higher education at Greek, British, Turkish or US universities, while there are also sizeable emigrant communities in the United Kingdom and Australia. Private colleges and state-supported universities have been developed by both the Turkish and Greek communities. The Cypriot system follows the Greek system in the south and the Turkish system in the north. A large number of students (after A levels) study abroad, mainly in English speaking countries such as the US, UK, and Australia, but also in other European destinations such as France and Germany. With the opening of Eastern Europe the students also have the opportunity to go to universities in Romania, Hungary etc. Cyprus has an established football League of its own though, in the past, the champions of Cyprus competed in the A' Division of the National League of Greece (1968 - 1974). The National Team of Cyprus hit a high when they defeated Spain 3-2 on September 5, 1998, in the qualifiers of Euro 2000. This page was last edited on July 7, 2009, at 12:19.